What is a Luxury Apartment Anyway? While the practical purpose of an apartment is providing shelter, the reality is that you have an overwhelming emotional connection to the place you call home. You want more than just four walls and a roof over your head. Home is your retreat, your sanctuary, the site of good times with family and loved ones. You have probably heard the term "luxury apartment" many times before. It sounds great, but what exactly does it mean? Here are some of the key features to look for that take an apartment from simply a place to hang your clothes to a comfortable and cherished home. The customer offered by the leasing team should be outstanding. Committing to a lease is a big financial investment, but it is also a big emotional investment. You should feel welcomed from the start. All the upscale amenities lose their luster quickly if you do not get the level of customer service you deserve. When it comes to kitchens, some apartments focus only on function and sacrifice form. Appliances and decor schemes are outdated, with no extras like wood laminate floors, modern cabinetry or attractive lighting. Even if your preferred form of cooking is Thai carry-out, a beautiful and useful kitchen is often the soul of a home. Closets may not sound particularly glamorous, but how would you get along without them? Walk-in closets give you added storage space where you really need it. Your wardrobe also lasts longer when you don't have to pack your clothes in like sardines! The benefit of no upkeep turns into a liability if you can't get anyone to address problems on a timely basis. Emergencies don't respect your schedule, so it helps to have a 24-hour maintenance team that is ready to respond when you need them. For those issues that go beyond leaky faucets or broken windows, it's also nice to have the assistance of courtesy officers who maintain the peaceful ambiance of the community. Pets are cherished companions for singles, couples and families, giving you an extra reason to look forward to coming home at the end of the day. Some apartment communities are more concerned with a pet's impact on their grounds than with the wishes of their residents. Luxury apartment communities recognize the importance of pets, and some even include extras like pet spa areas and off-leash dog parks to make them feel equally at home. As wonderful as your home is, you will want to get out, meet people and have fun. Lifestyle amenities such as resort-style pools, 24-hour fitness centers, car care areas and clubhouses make it convenient to relax, enjoy your leisure time and develop friendships with your neighbors. If you have a community management team that goes the extra mile to promote interaction with holiday gatherings and other events, you've hit the jackpot! Our Springs Apartments communities are designed with your comfort and satisfaction in mind, offering these features and many more. We treat you as a valued member of the community from the moment you set foot in our office. 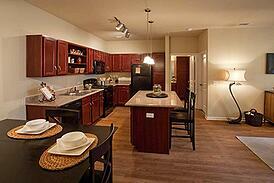 At Springs Apartments, luxury is a way of life, not an extra!